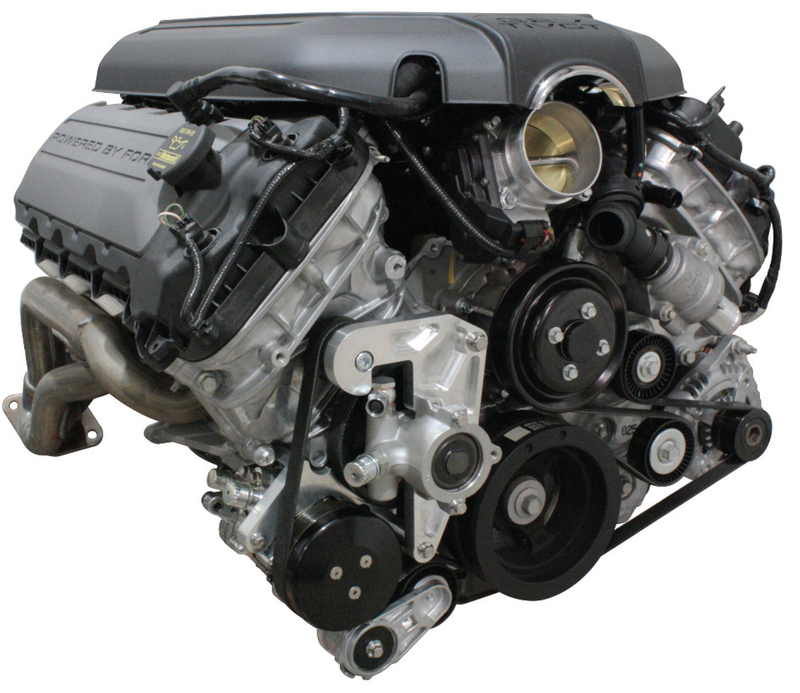 Vintage Air, the leading manufacturer of complete performance air conditioning systems and billet accessory drive systems for classics, hot rods, muscle cars and trucks, has announced the release of its new Front Runner system for Ford Coyote 5.0L Engines. With the return of the 5.0L to the Ford Lineup, the Coyote engine has positioned itself as a popular choice for hot rodders and customs truck builders alike. In response to the growing popularity of the Coyote engine, Vintage Air has designed a sleek and simple Front Runner Bracket system that cleans up the engine bay by removing unnecessary mounting holes while maximizing performance. These new Front Runner systems are machined from the same high strength 6061-T6 billet aluminum used on all Vintage Air Front Runner kits. The system retains the factory Ford alternator and water pump drive located on the left (driver) side of the OEM engine drive and adds a precision-machined compressor cradle and power steering pump mount to the ride (passenger) side. The system also includes a Detroit Speed aluminum power steering pump. The system is available with power steering or without power steering. The system with power steering (Part# 174020) which includes a precision-machined compressor bracket, Sanden natural finish compressor, black compressor clutch cover, Detroit Speed aluminum power steering pump for remote reservoir, precision machined power steering pump bracket, power steering pully, Dayco perf serpentine drive belt, Dayco OEM tensioner, idler pully and ARP Stainless 12-point Hardware Kit. The system without power steering (Part# 174007) includes the same parts listed above except power steering bracket, pump, tensioner and pulley. Vintage Air Front Runner systems are proudly manufactured in the USA, include parts necessary for installation, and are backed by its standard warranty. For more information on the Vintage Air Ford Coyote Front Runner or any other product, visit www.vintageair.com or call (800) 862-6658.